The evolution of tactical stun flashlights continues with the introduction of the Police Force 7,000,000 Tactical Stun Flashlight. In the past customers had to choose between a compact tactical stun flashlight that was very portable but had only a marginal electrical charge and light or they could purchase a large unit with a powerful light and stun gun that was bulky and cumbersome to carry with them. The Police Force 7,000,000 is a game changer. This military grade aluminum alloy unit packs the stun and flashlight power of the big models into a unit only a little larger than seven inches long! It incorporates Triple Stun Technology (TST) which creates a powerful electrical storm on the head of the unit. 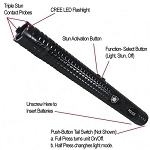 This is also the first compact tactical stun flashlight to improve the position the safety switch and stun button. Other models have these buttons located on opposite sides of the unit which can make finding the stun button difficult in a panic situation. In our improved design we made the stun button three times larger and positioned it directly above the safety switch. 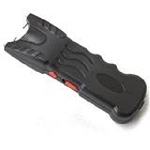 Triple Stun Technology: Streetwise Security Products continues to innovate and improve the designs of their stun guns. The SWPF8000R is the first model to incorpate Triple Stun Technology which allows the electrical charge to quickly jump between both edges and the middle of the prongs which creates a loud and bright electrical burst. Improved Design: The SWPF7000R is the first model to have the safety switch and stun button on the same side of the unit. This allows you to quickly turn off the safety and press the stun button. Safety Features: To prevent accidental discharge, Three levels of safety have been built-in. The on/off switch must be in the "ON" position, the function selector switch must be in the "stun position" and trigger pressed before the stun gun will operate. See the enclosed instructions for complete details. Holster and Wrist Strap Included: To make this unit easy to carry, the unit includes a wrist strap and the heavy-duty holster includes a belt loop. Lifetime Warranty: The Police Force 7,000,000 is made of the highest quality components and comes with a lifetime warranty. See the enclosed instructions for complete details.